Is there a way to make the camera work like the standard third person template, without the click and drag and have the cursor only pop up when the inventory is open? Yes, just give me a little bit and I'll make a quick tutorial video showing what to change and I'll post it here. Last edited by Pirate; 01-27-2016, 09:24 PM. Been playing around with this in my survival project. It's nice and clean. Probably the best package I've seen on the marketplace so far. Last edited by Robviously; 01-27-2016, 10:51 PM. I was able to make my own lootable NPC, however the Gold Amount seems to be capped at 208 for setting the quantity they're carrying. I haven't been able to find where that max value is stored. Thoughts? The Item Amount and MaxStackAmount variables are a BYTE which is capping Items to have a max Amount of 255 (a BYTE can be a value of 0-255). It was done as a network performance optimization (you may have noticed in a lot of games the max stack size is usually up to 256). But now I think it's a little overkill, so I'm going to change it back to an INT to keep it simple for people in the next update. I will submit the fix ASAP. Last edited by Pirate; 01-28-2016, 12:53 AM. 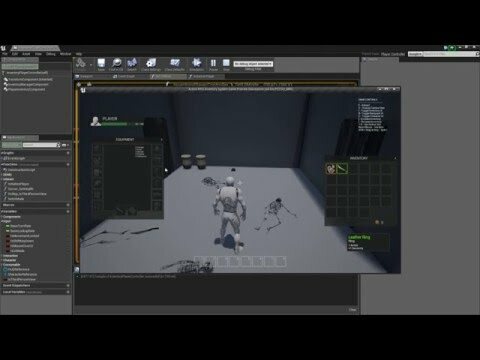 Added this into a survival game project me and a friend are working on, and it is very easy to setup, now its time to try to add a crafting system to it, for the price i think its well worth it. Glad to see the camera "fix" is easy to implement, and thanks for the video Pirate. One thing I am wondering about that I have come across, is there a way to reset the Character/Inventory/Player Health boxes? If the demo is running in window mode and you click and drag a box off screen, it's gone for good! It would be great if there was a "Re-initialize UI" button that would put all boxes back on screen in their default position or even if the boxes could only be dragged to the edge of the screen and then couldn't be pushed over past the edge of the box. Also, the item info floaty box always appears down in the bottom right corner. It would be great if it popped up near the item you are hovering over. I just haven't got that far yet! You can make the dragable boxes so there screen bound, so they can't be dragged to far off the screen, this will probably be fixed in a update but i can show you how this can be added in once I'm home from work. Also, you can easily set it up so the windows always open at the same initial location. This may be something you might want to do depening on the project and should only take a few minutes. Setting the item hover location would be a quick change as well. I can see that being an issue if you're moving widgets and tossing them around a lot. I will work on adding a "Lock to viewport" type setup for the next update. Also I'll add Tooltip at mouse location to the TODO list. I am very invested in this and I want to assure you all that I will do my best to support the products and make improvements as the engine changes and newer features are made available. I also welcome feedback and want to make sure even the demo content is a good working base. If the suggestions benefit all users I am happy to make the updates. If it's a more specific request I'll try to do a tutorial so it doesn't clutter the base code for others who won't need that change. That would be great if you can post it in the thread so other people can make the changes themselves too instead of waiting for an update. Because it might not be until Monday at the earliest until the update is out as epic doesn't work through the weekend and I am working on creating a bunch more video tutorials over the next few days. I will also be creating a changelog in the first post so that people can see what is coming in the next update and a change log of all the additions since launch. Last edited by Pirate; 01-28-2016, 03:30 AM. Great work ! this is awesome. I've read people have managed to merge this system into their own project, but I can't seem to figure out how. I already have a character bluprint in my prototype and merging this system in my project (obviously), doesn't seem to do much. I thought I could copy the gist of it in the level blueprint but since I'm a beginner of course I didn't realize my mistake before visualizing it. Any idea how I can merge the systems with my own project ? Thanks again for this hard work, the example map itself works very well. You will have to update the cast from InventoryPlayerController to your own controller in some of the Usable blueprints and also the InventoryManager and UI Blueprints. Also I would recommend changing your character class to use the EquipmentCharacter as it's base that way you don't have to manually move the player equipment setup into your own character if you don't want to right away. I will be releasing a video later this evening that will go over the merge steps. Thanks for the quick response! That makes sense now, and I will probably cap each stack of inventory items to 99 to keep things neat, but am looking forward to uncapping the Currency limit. That will make boss rewards, quest rewards, etc more lucrative. Thanks again!